Ethics are the values that govern our decisions and actions. Some companies have clearly defined written codes of principles for determining the difference between good and bad behavior. Good ethics boils down to knowing the difference between right and wrong and choosing to do what is right. This course will explore the definition of ethics in the eyes of the Internal Revenue Service, as well as the important covenants contained in Treasury Circular 230, which governs practice before the IRS. Additionally, this course will discuss the various penalties and sanctions available for violation of the rules by individuals allowed to practice. 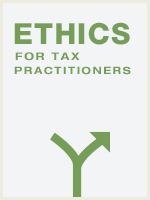 Explain the role of ethics in the tax preparation industry. Explain the IRS rules as outlined in Circular 230. Identify common ethical violations and penalties. Discuss procedures that promote compliance with ethical guidelines.